Stop playing whack-a-mole with your Chromebooks. Are you getting the full potential from the Chrome device management model? Do you move sets of Chrome devices into organizational units to optimize device settings for different groups of users, or for special use-cases, like kiosk-mode for computerized testing? Do you use the Chrome management console to keep asset IDs, usernames, locations or notes up to date? 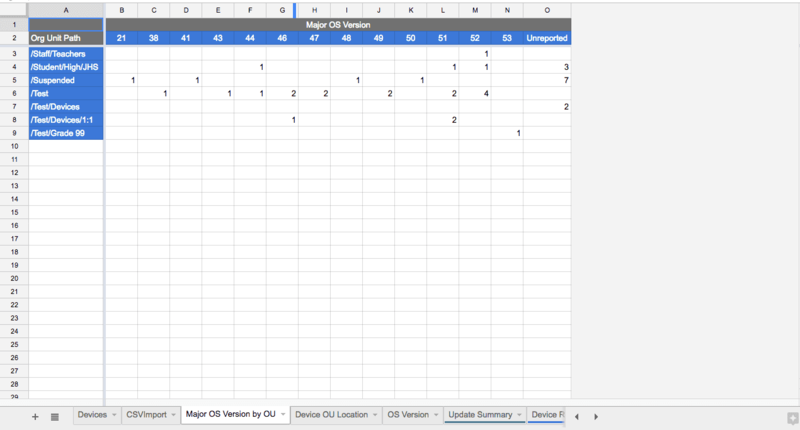 Can you quickly track down devices with older versions of Chrome, a specific serial number, used recently by a specific user? When devices turn up damaged, or when users are suspected of vandalism, can you get the evidence you need to resolve the situation? 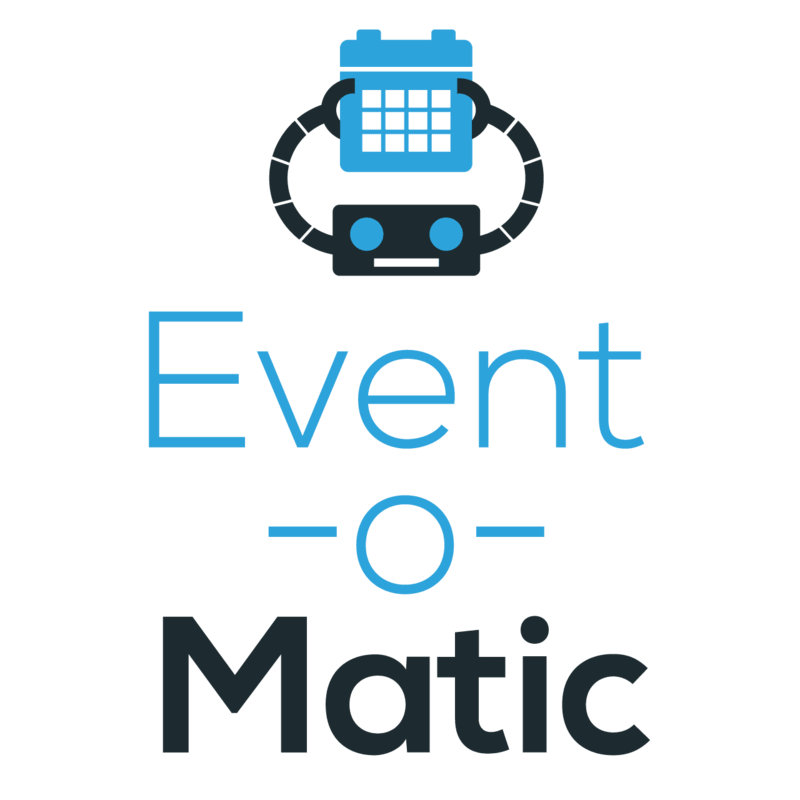 Limited search parameters make it challenging to fully explore patterns or filter for groups of devices by a specific characteristic. 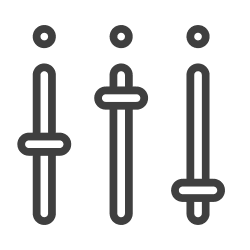 Without a 3rd party tool, keeping annotated fields like location, asset ID, user, and notes up to date requires painstaking, device-by-device data entry. Selecting and moving a large number of devices from one organizational unit to another can be quite challenging within the console interface. There are no search options that query against device activity history. 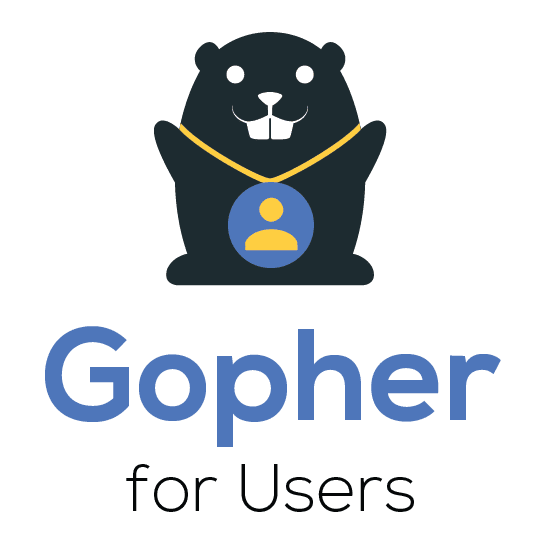 Extends the reporting powers of the Gopher for Chrome to include user sessions that capture username, local & public IP address, start time, and session duration in minutes. 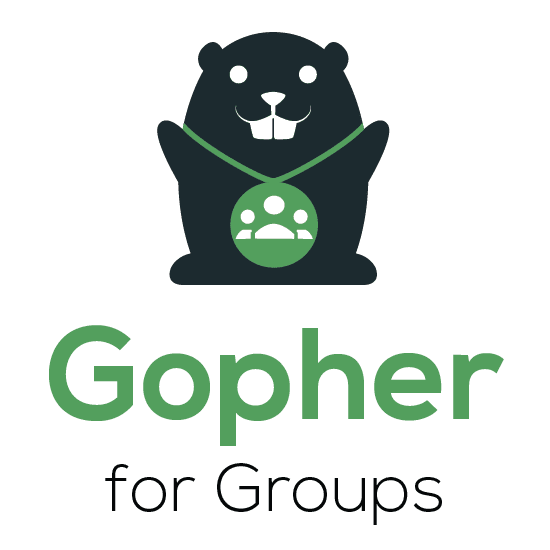 Gopher for Chrome is an Add-on for Google Sheets that can be installed by any user with administrative rights to manage Chrome devices. 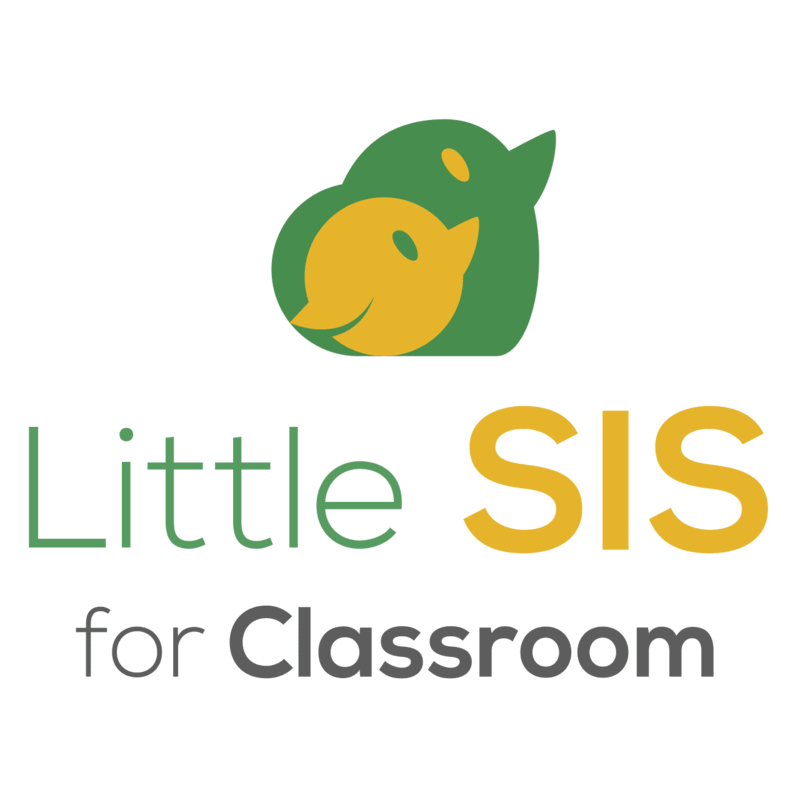 This means that you can empower school or division level device managers with the full functionality of Chrome Gopher, but limited to only those org units for which they are allowed to manage devices. 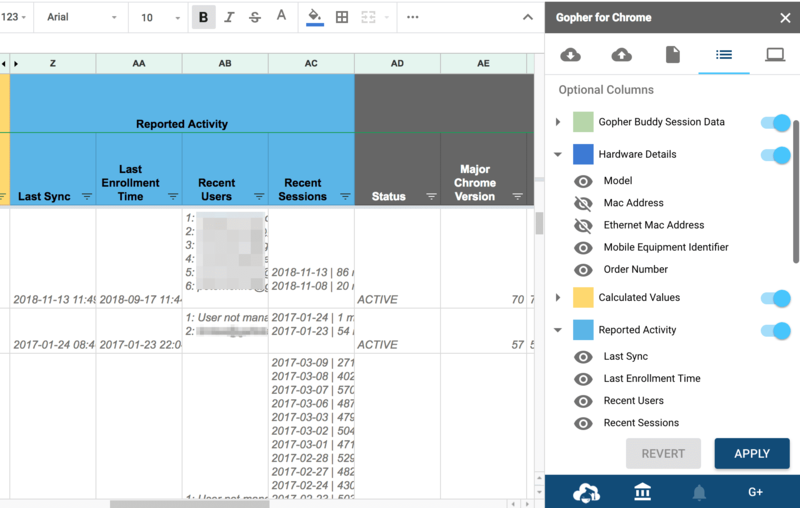 Chrome Gopher lets your Chromebook fleet data enjoy the full power and flexibility of Google Sheets, including filters, formulas. 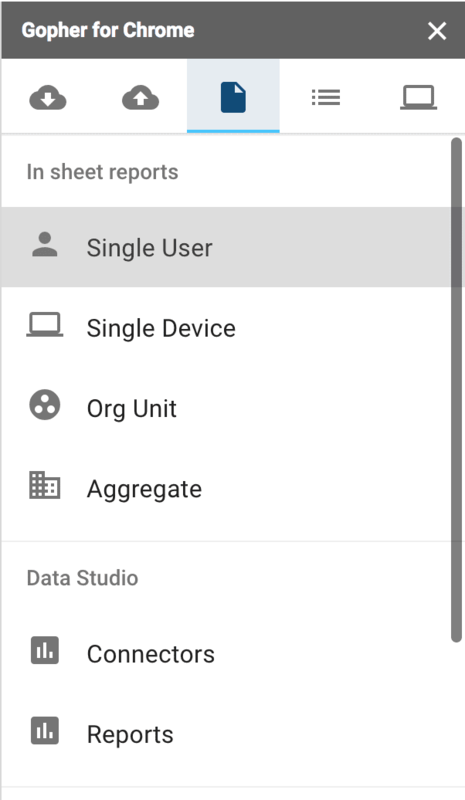 Hook your sheet up to Google Data Studio report templates to make the numbers pop! 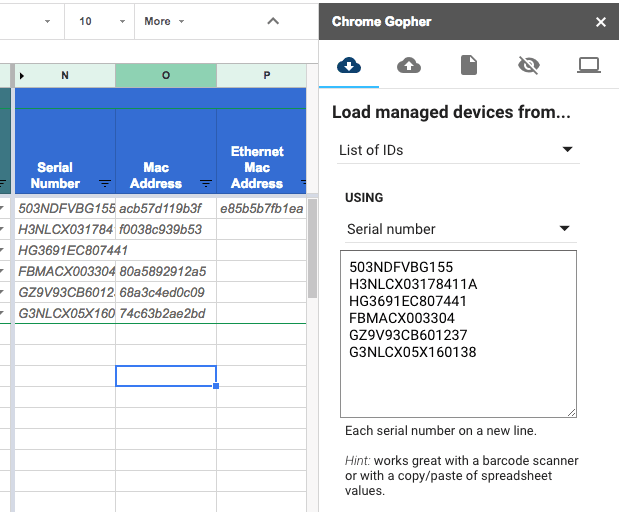 Chrome Gopher can handle very large update jobs, allowing you to bulk-update any of the Chrome-writeable fields, including Asset ID, Annotated Location, Annotated User, Notes, and Organizational Unit. Getting rid of a large number of old machines? Chrome Gopher saves time by letting you mass deprovision devices — removing them completely from management. 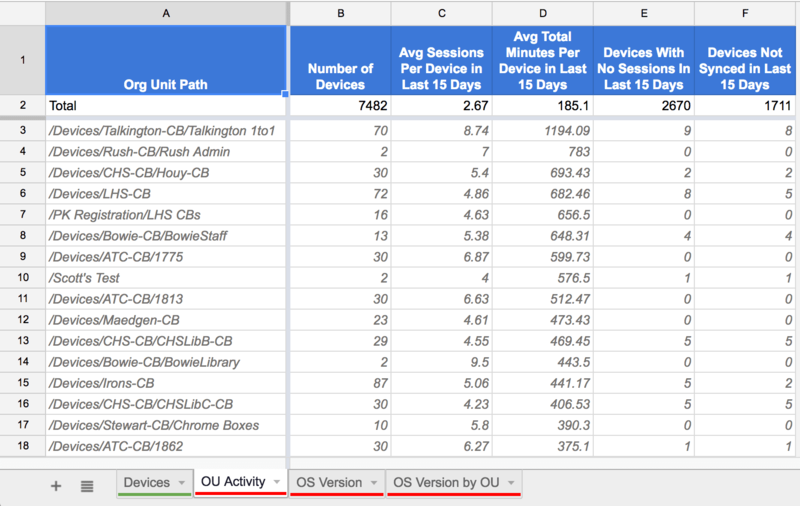 Quickly isolate outdated Chrome versions and device counts by OU. 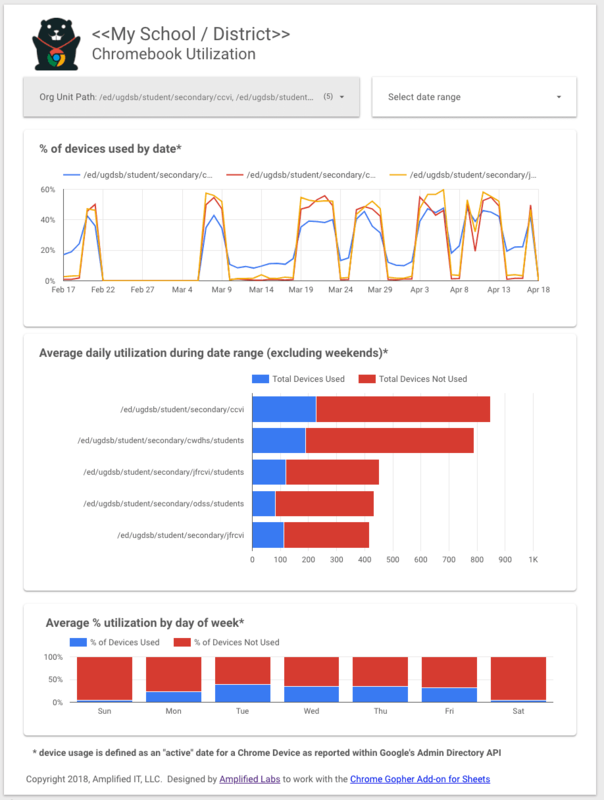 Knowing where your devices are being used, and where they aren’t, can inform everything from device allocations to support strategy and gives key stakeholders a window into the returns on a district’s Chromebook investment. 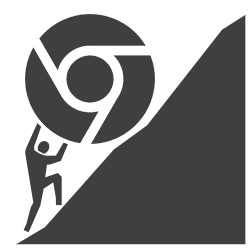 Easily connect Chrome Gopher’s auto-refreshing reports and use them to feed powerful & pretty reports in Google Data Studio. Learn more. 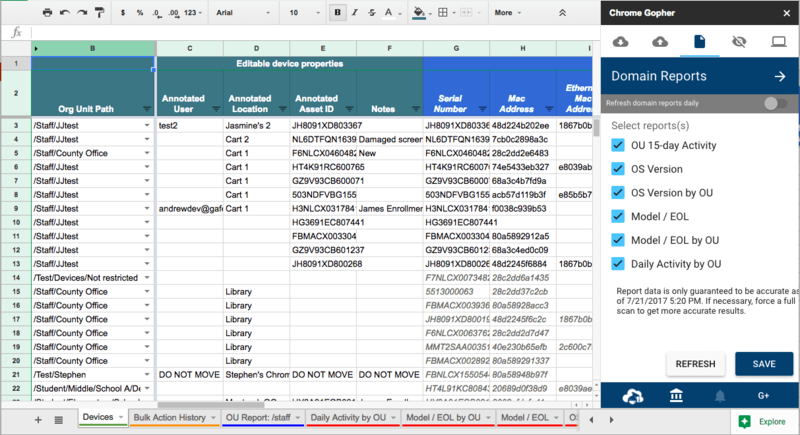 Many districts maintain an inventory or asset management system where a lot of useful information about their Chromebooks lives. This information can include Asset ID, Annotated User, Annotated Location, and Notes, which ideally you’d like to keep updated in Google’s Chrome Management console. 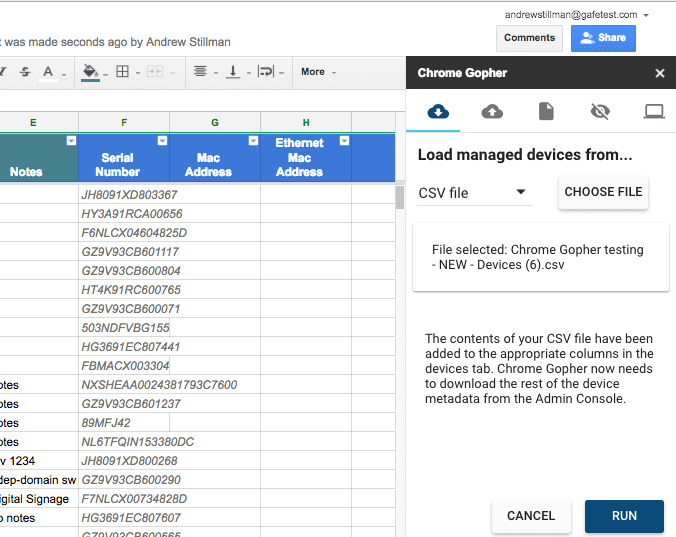 Since most asset management systems will export a CSV dump of data, we decided to make it easier to bring your asset management data into Chrome Gopher’s Device tab. 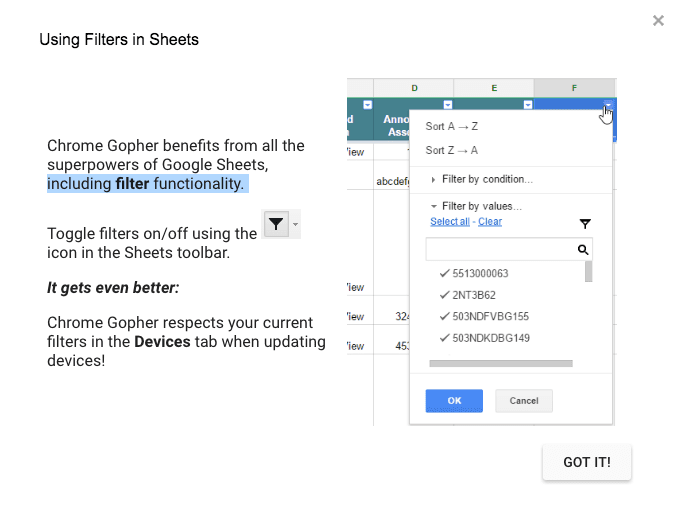 Not only can you search by any condition within any Chrome Device attribute, but Chrome Gopher respects your filters during updates, which means that you can bulk-modify only those devices that are currently visible in the Sheet. 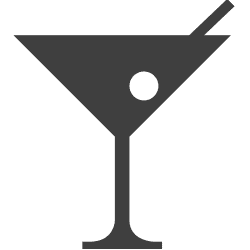 Chrome Gopher can search across and report out all devices on the domain that have been recently accessed by a specific user, and it can report on all user and session activity for a specific device. Quickly hide / unhide columns to give yourself and / or stakeholders only the relevant information for the task at hand. 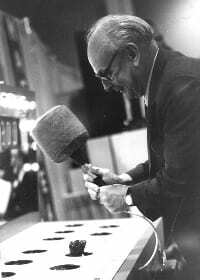 There are times when you’re looking to quickly discover information and make modifications to a single device at a time. 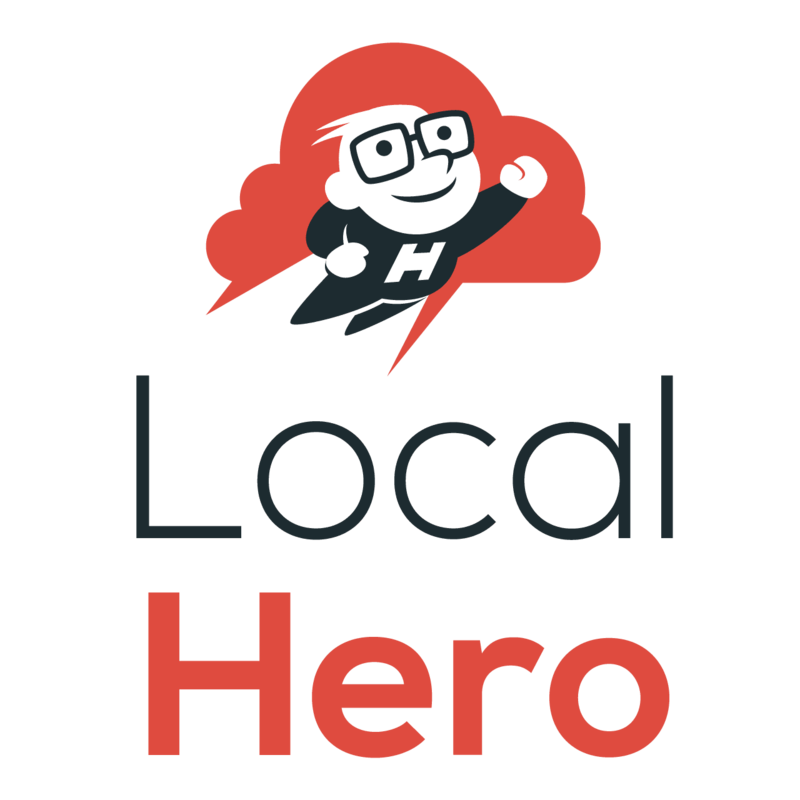 For example: when distributing / assigning machines to students in a 1-to-1 program, or when tracking down a lost and found device. The quick find and update panel makes it possible to search for and quickly modify device information! 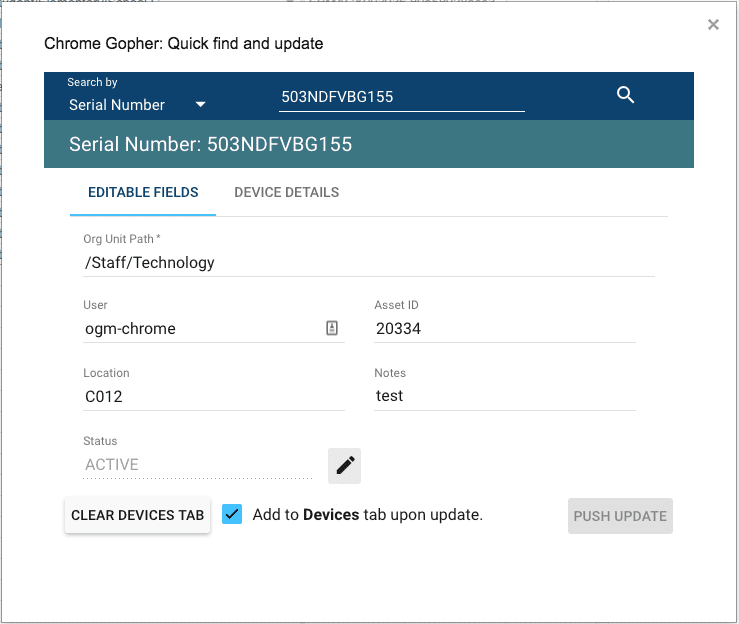 School IT staff can use a barcode scanner to quickly enter serial numbers and asset IDs to batch-update devices in Chrome Gopher. Need to check that this set of 35 devices are in the correct cart? Need to move these 100 newly-unboxed machines into the correct org unit? 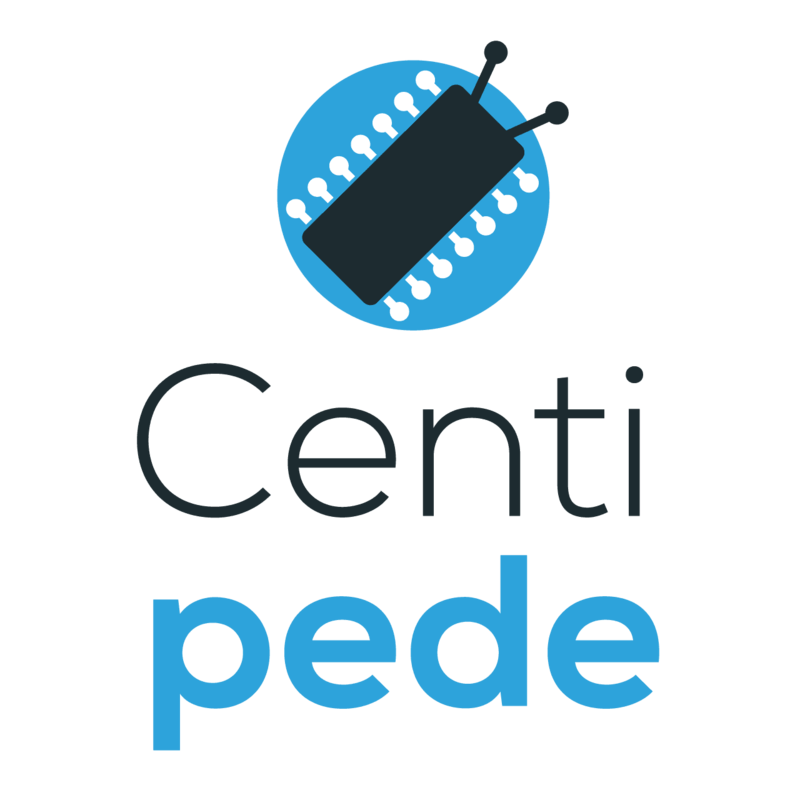 Scan a list of devices directly into the sidebar and import them into the Devices tab, along with all their current Google reporting metadata, and update away! 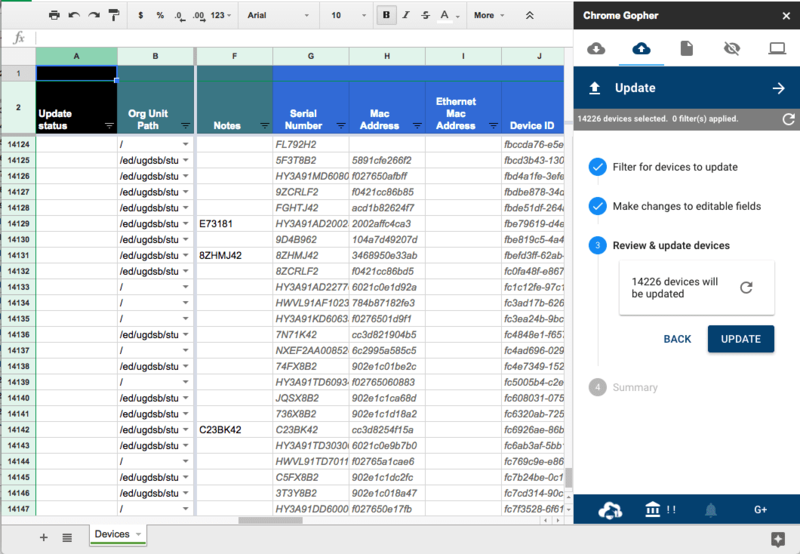 Put the full, flexible, filterable, formula-funtastic and feature-rich experience of Sheets to work against your bare-metal device data — just as it comes out Google’s APIs. If you’ve been doing all of this stuff manually in the admin panel, Chrome Gopher will give you back your weekends. 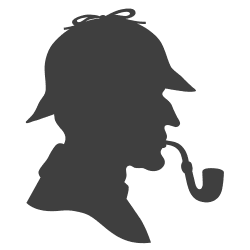 Your colleagues will indubitably remark upon your new swagger in solving workaday Chromebook mysteries. 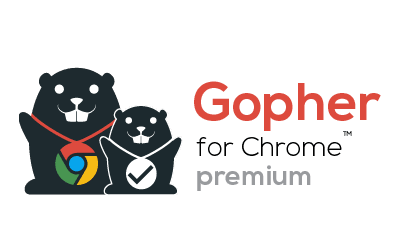 Existing Chrome Gopher Basic subscribers can apply the remainder of their subscription as credit towards an upgrade. 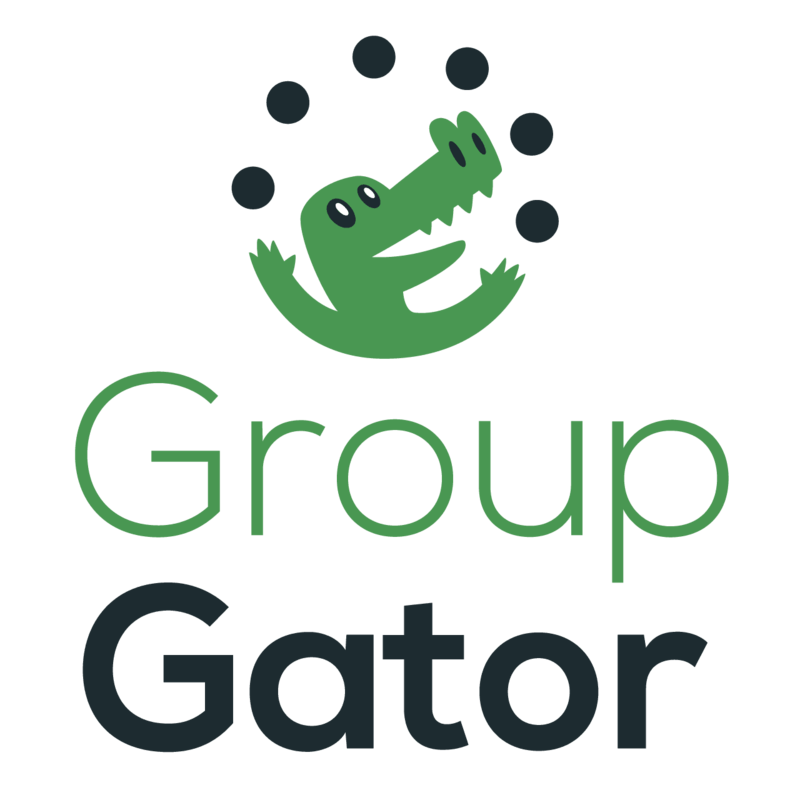 Root out, fix, and monitor those pesky / risky Google Groups access settings. 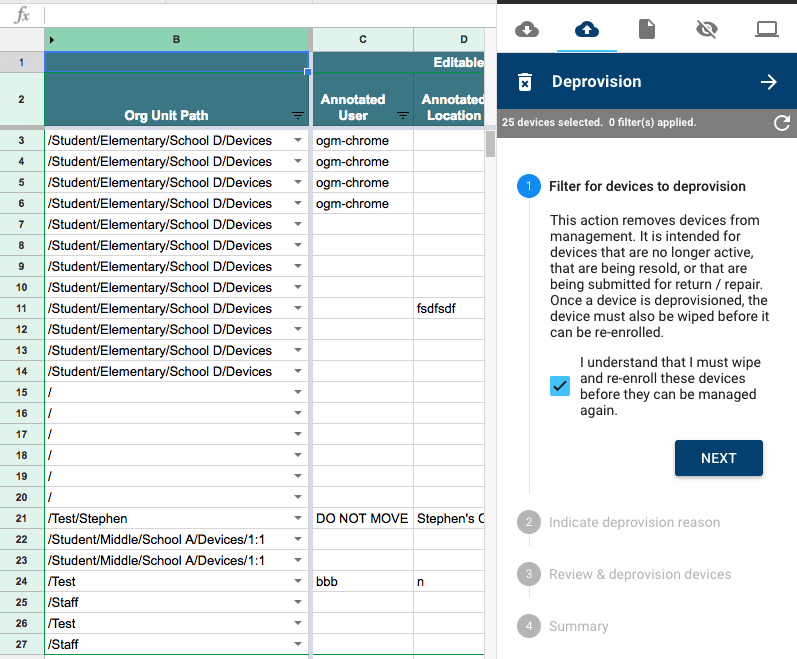 Automate the enrollment of Chromebooks, saving hundreds of hours.